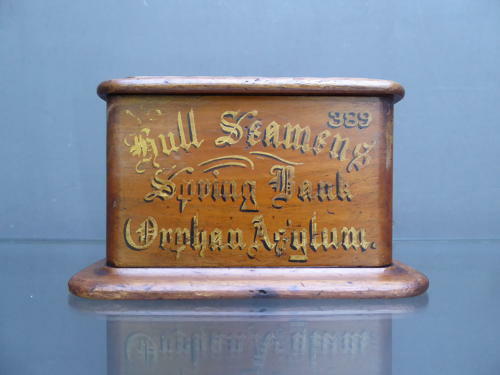 A wonderful antique chariry collection box for the Hull Seamen's Spring Bank Orphans Asylum. A charming little collection box, beautifully made in mahogany, finished with gilt shadowed lettering to the front panel & a coin slot to the top. The Orphan Asylum was set up in the mid 19th century, the buildings were designed by T W Wyatt & the grounds covered two full acres of land. The institution admitted orphans connected with or born in the port of Kingston upon Hull & while others were considered, the local children took priority. It closed in 1985 due to a lack of admissions. Wear commensurate with age, varous marking to the finish (most notably the top), cover to the underside missing, displays beautifully.